The youngest 7th degree black belt in world ranking history. and the most accomplished Martial Artist in the St. Croix Valley. 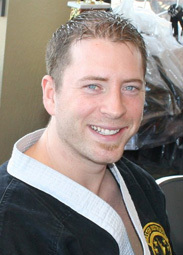 As Master Instructor and owner of The Edge Martial Arts, I invite you to start or continue your Martial Arts journey with The Edge. At THE EDGE, each student starts at the same beginner level and works towards the same goal (black belt). Students are given as much time as necessary to gain a complete understanding of each belt level and advance at their own pace. We encourage individuals to challenge themselves and a strive to reach their own highest level of perfection. We understand that goals vary for each and every student, and our memberships are in support of that. Whether your commitment level is as little as an 8 lesson punch card or a year of unlimited classes-- we have a program that you can be comfortable with. If becoming more physically fit, confident, and able to defend yourself is something you’d like to accomplish for yourself or your child, I welcome you to join us.